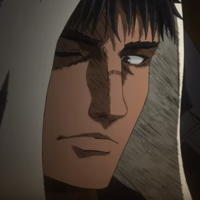 Some familiar faces and voices, not to mention that Susumu Hirasawa music, are paired with new characters in a first teaser for 2016's Berserk TV anime. Presented with this was the news that Yokohama based rock band 9mm Parabellum Bullet will perform the summer anime's theme song. Crunchyroll has announced plans to stream the anime.